Hello, everyone and Happy New Year! After a rough twelve months, I am optimistic about what 2017 will hold. For the first time in a very long time, I feel empowered to make positive changes in my personal life and in the world. To feel optimistic at this point is no small feat. 2016 was, hands down, the worst year of my life. I was plagued by loss and ill-health while it seemed Western Society as I knew it crumbled around me. Not surprisingly, my read suffered and my the goals I had set at the beginning of the year had been all but abandoned by April. By midyear I lowered my GoodReads Reading Goal from 100 to 75 books and focused my efforts on achieving that one goal. In 2016, I read 76 books totaling 14, 876 pages. My average GoodReads rating for the books I read was 3.3. I read five books that were 5 star reads. I read nineteen 4 star books. I read forty 3 star books. I read eleven 2 star books. I read only one book that was a 1 star read. On average, each of the books I read was about 196 pages. The longest book I read was A Tale for the Time Being by Ruth Ozeki (422 pages). The shortest book I read was The Lottery by Shirley Jackson (12 pages). Overall, I am not happy with how much I read last year. Even though I met my GoodReads goal, I predominantly read shorter books that I wasn't passionate about. I am stingy with my five star ratings; I reserve these ratings for books that have changed my life or way of thinking in one way or another. To earn a four star rating from me, a book has to be enjoyable or compelling enough for me to recommend it to others. A three start rating, on the other hand, only has to be a book that is "okay" but not necessarily be one that I would recommend to others. A two star book is one that may not have been entirely unreadable, but is problematic in some way. Lastly, a one star book is one that is so bad that I would wallop the author with their own crappy book if I had the chance. My passionless reading, I believe, had a lot to do with my desire to meet my GoodReads reading goal; I used shorter books to get closer to my goal because I was crunched for time. In retrospect, I can also see that being grief stricken and ill most of the year had an impact on what I read: I consumed easy reads and graphic novels that I could mentally escape into, even though I didn't find enjoyment in them. For 2017, I have set my GoodReads goal at 50 books to encourage myself to read longer texts. Also, a smaller reading goal will also help me to make more judicious choices. In 2017, I want to feel enthusiastic about what I read and learn from what I pick up. Having a manageable reading goal, approximately one book a week, will help make this possible. 77.7 percent of what I read was in print format. 10.5 percent of my reading was in audiobook format. 11.8 percent of my reading was in ebook format. 88 percent of my reading was fiction. 12 percent of my fiction reading was short stories. 34 percent of my fiction reading was graphic novels. 54 percent of my fiction reading was in traditional novel format. 4 percent of my reading was poetry. 2 percent of my reading was drama. 6 percent of my reading was nonfiction. Overall, I am happy with the format that my reading took in 2016. I generally prefer to read in print, but I do find the occasional audiobook or ebook a convenient when I am on the go or suffering from a migraine. However, I am less happy with the genres that I read. In retrospect, I read far too many graphic novels and not enough non-fiction. Ideally, I would like twenty-five to thirty percent of my reading to be nonfiction. This year, I intend to read fewer graphic novels; I will only be continuing with series I have already started or reading nonfiction graphic novels (I've recently started Congressman John Lewis's graphic memoir March). 46 percent of the books I read were by male authors. 54 percent of the books I read were by female authors. 78 percent of the authors I read were white. 22 percent of the authors I read were people of color. 89.5 percent of the authors I read were cis-gendered/heterosexual. 10.5 percent of the authors I read were LGBTQIA+. I am happy to see that I read more books by female authors this year than by male authors; broadly speaking, my author distribution is not all that different from the gender breakdown in the general population. So, I am happy with this. However, I am displeased that I haven't read as many works by people of color or by members of the LGBTQIA+ community and I am actively looking to have at least 50% of my reading be by POC or LGBTQIA+ authors. Given how tenuous things look geopolitically, I think it is important that I read more works by authors from minority populations, not only to support their work, but to educate myself in a time of misinformation. 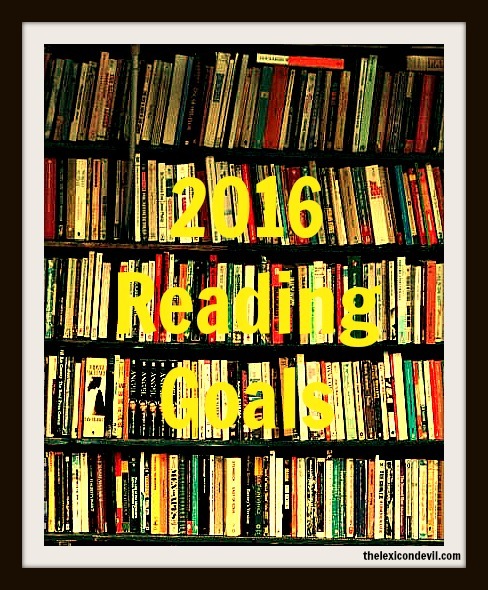 So, even though I had a rough reading year in 2016, I have plans to make 2017 a better, more diverse reading year. What are your reading plans for 2017? Let me know on Twitter @thelexicondev.